Just making it to the golden years by 60 is already challenging enough. 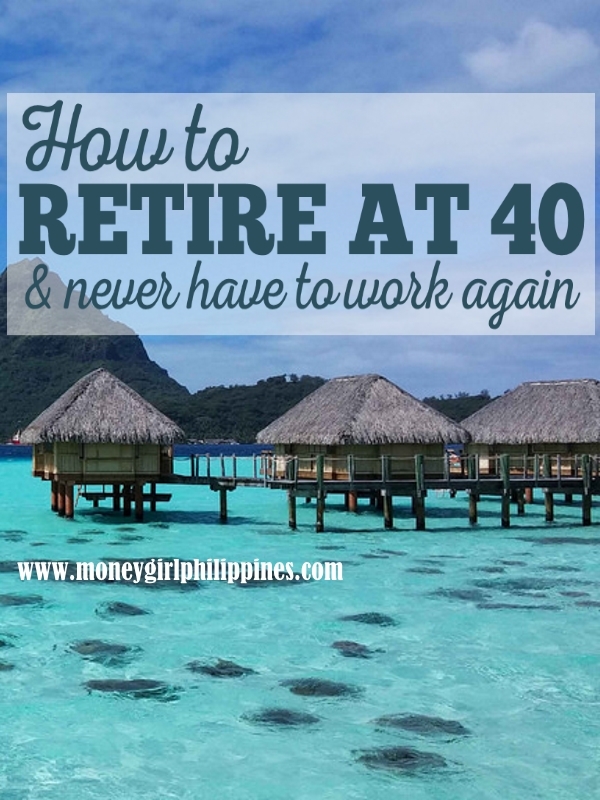 So retiring at 40 seems like an impossible dream. Yet, there are a growing number of early retirees who have managed to call it quits in their 40s and they don’t happen to be lottery winners, celebrities or business tycoons. Just average people with goals and ambitions. I was 22 years old when I decided to retire by 40. To provide well for my family. To develop my skills and talents. No more worries about financial security. No more 8-hour days of anything other than what I choose to do with my time. Basically, retire young enough to enjoy it all. Now, I’m 30 years old. How do I plan to retire in 10 years? Here’s how. Living below your means is basically spending less than what you’re making. 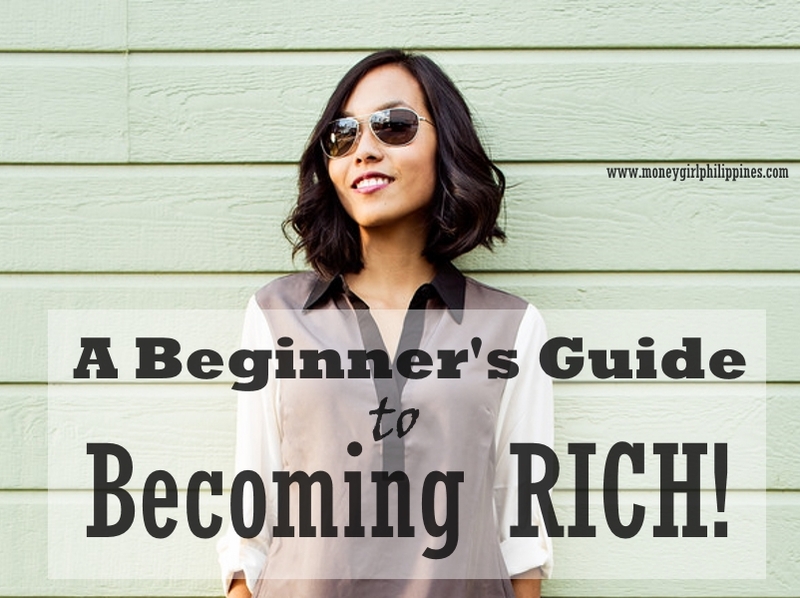 You begin by figuring out HOW MUCH MONEY you want TO SAVE. Whether it’s Php500 or Php5000 per month, set up a bank account where you can keep your savings safe. Allocate what’s left of the money to essential expenses like food, rent, gas, etc and cut out ALL unnecessary expenses. Living beneath your means is not always easy to do, it takes discipline. So, does living beneath you mean you have to make those spending cuts and never afford “extras” or dream big? NO, it doesn’t! You simply have to figure out HOW you might afford those dreams without going into debt- create a budget and work on it. You can have a sideline business or sell some items. Don’t think of living below your means as restrictive, but as a safe boundary. When you are able to increase your income, you can increase your boundary. “Saving as if your life depends on it” is the cornerstone of the early retirement concept. When you can save that much money, the whole idea of early retirement becomes much more likely. Let me share to you the shockingly simple math about saving. For this, let us assume that your annual return of investment is 5% and your withdrawal rate is 4%, which means you spend 4% of your net worth each year. If you save 0% of your income, you will never be able to retire, because you will never be able to invest money that will then earn money for you for your retirement. If you save 25% of your income, you can safely retire in 32 years. If you save 50% of your income, you can safely retire in 17 years. If you save 75% of your income you can safely retire in 7 years. If you save 100% of your income, you can retire right now, because somehow you are living without needing to make anymore money. Saving is not always easy. But by making smart decisions, avoiding debt and living simply, you can be able to save. Cutting spending is better than just increasing income, because no matter how much money you make, decreasing your spending will speed up the process of retiring early. (But of course, I do encourage increasing one’s income as well to help you save more!) Do you want to retire in 10 years? Invest 66% of your income! Let’s be honest, most of us cannot live entirely debt-free. (I actually have a real estate loan and a business loan. But, I call it good debt because it is money borrowed to pay for items that appreciate in value.) The debt we all MUST AVOID is BAD DEBTS, or money borrowed to pay for items, items that you can afford to pay for and that generally depreciate in value. Credit card debt is often considered bad debt. You should never accumulate debt to purchase everyday items like clothes or food. If you use a credit card for these types of purchases, you should pay the balance in full each month. Most young people think that they don’t need insurance. After all, death/sickness is far away from 20- and 30-somethings. There are, however, certain cases when young people should consider signing up for (especially if you plan to retire early)- life insurance and medical insurance. Life insurance is a product to provide protection and comfort to loved ones in case of an unexpected tragedy. You should consider having life insurance especially if you have people depending on your income. Proceeds from the life insurance policy could help provide debt protection, support education and living costs, burial and funeral costs, estate taxes. In reality, life insurance doesn’t have to be expensive. Having a term life insurance provides coverage for a limited period of time (for example, 10 years, 20 years or 30 years) and is one of the most cost-effective ways to purchase life insurance. If you plan to retire early, medical or health insurance is another product you should have. It is a type of insurance coverage that covers the cost of an insured individual’s medical and surgical expenses. People do get sick at some point in life or face an injury-related emergency or accident. So when this happens, you don’t want to dip into your retirement savings to pay for hospital costs. By having health insurance, your hospital expenses can be reimbursed back you or the insurer makes payments directly to the health provider. In general, insurance is NOT an investment, it is merely a form of PROTECTION. Everyone (both young and old) needs some sort of protection. It’s ironic to hear that in order to retire early, you usually have to work harder. That means dedicating more time and effort to earn more money that the average person might. This could mean pay raises at work or by earning more income on the side. If it’s unlikely to get a huge promotion at work, you can earn by starting your own side business, or doing some freelance work. 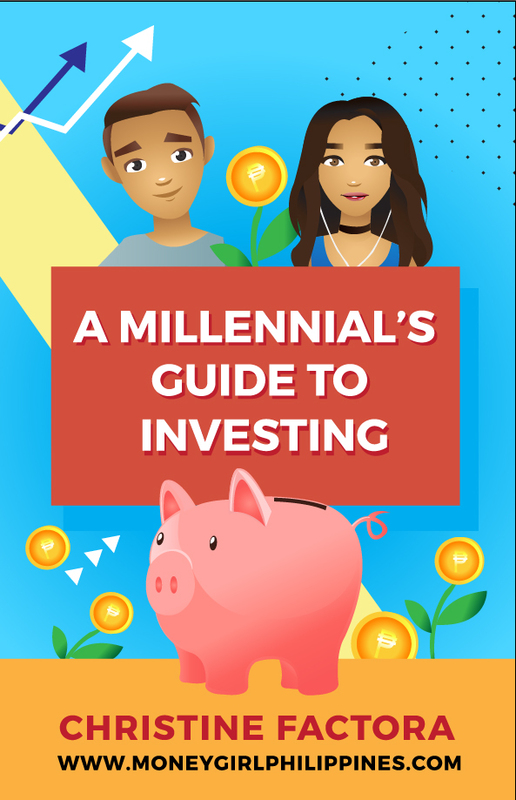 Making more money is a great way to accelerate your early retirement schedule, as long as you also follow the rule of living below your means and saving as if your life depends on it. Owning investments that generate passive income is a great way to sustain an early retirement. It is a kind of income that you can earn while having a good vacation, while sleeping, while you work or not work. . But in order to achieve this kind of sweet income, you may need to acquire and build them through time and a lot of hard work. Real estate investing is perhaps the most popular alternative investment. You can earn from renting out real properties, such as apartments, building and office space. Thus, you need to invest in real properties as early as possible, perhaps, while you are young. Rental income can also be earned from movable properties, such as vehicles and other equipment. Income-producing websites are another alternative investment and have been growing in popularity among the early-retirement crowd. You can earn from either advertising income or affiliate marketing income. Advertising revenue can be the in the form of direct advertising or third party advertising, such as Google Adsense and other PPC (Pay Per Click) advertising schemes. An example of this is the regular advertising income generated by this blog you are reading. Affilate marketing income is earned by promoting the products of other people or companies. Affiliates earn income through commission for every successful sales lead they made. 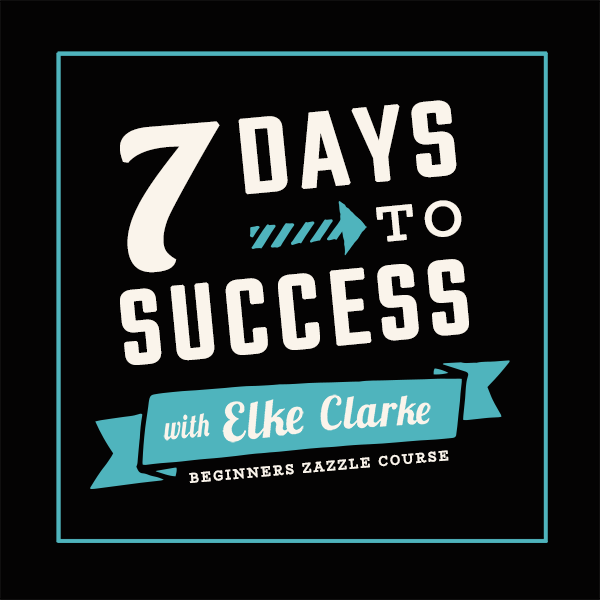 Like real estate, creating a income-producing website/blog comes with effort and hard work. You have to be patient in writing articles or blog posts, search engine optimization and social media promotion. At first, it’s not a large amount of money, but there is a potential for it to grow. 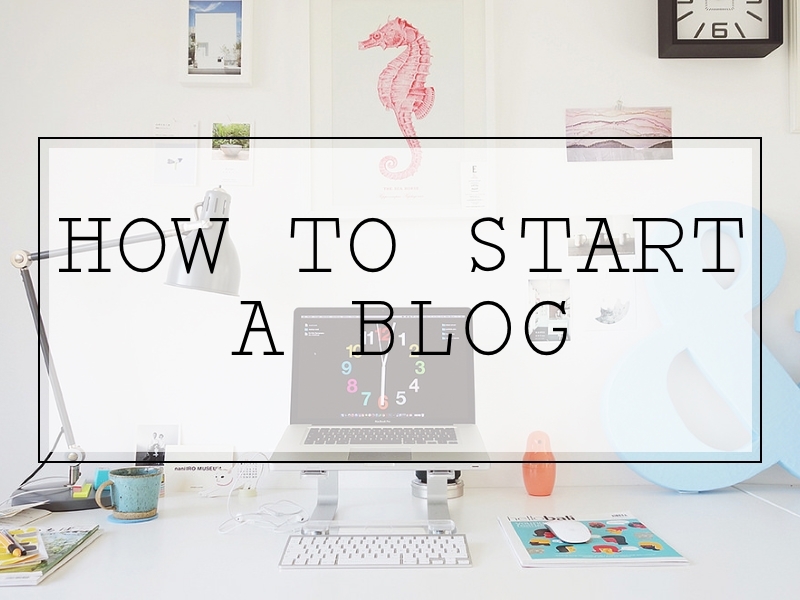 What I like about it is that even if a little work is only done on the blog, the income will flow consistently. Investing in dividend-paying stocks is one of my favorite ways of earning. 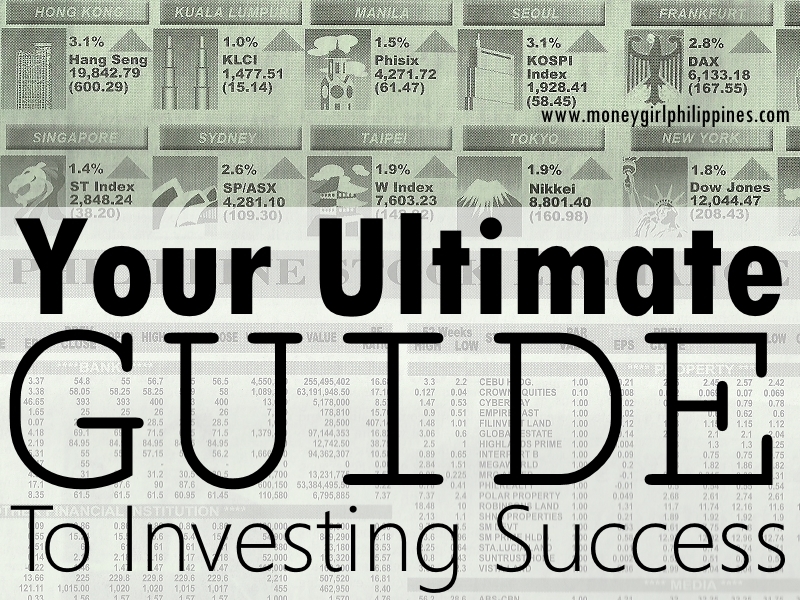 You can actually start investing with Php5,000! You invest in stocks or share of ownership in companies that give you a portion of their earnings. This involves a higher risk and may not become a regular income, but it can be turned into a good sustainable income. Another type of passive income is royalty fees– the asset that generates royal income mostly comes from a person’s great talents, skills and abilities. NO monetary investment, just your talent and creativity. For example, I have signed up recently with Zazzle.com (it’s FREE) and all I have to do it upload artwork that can be printed into items. Whenever a person buys an item with my artwork printed on it, I earn a royalty income. This can also be earned from publishing a book if you’re a writer, from music if you’re a great singer or musician or from using your photos if you’re a photographer. Invest in assets (or investments) that make more money for you – stocks, real estate, etc. Behold the magic of compounding interest! Each year, your money can earn interest on both the original amount and the interest earned from the year before. More years equals more interest, and more interest means faster asset growth and an easier path to early retirement! Let me illustrate the power of investing early with two people- Early Eddie and Late Leslie. Both start working at 20 and both want to “retire” at 60. Let us resume that the market returns 7% a year. Early Eddie diligently invests Php100 a month for ten years. He stops contributing when he turns 30 but leaves the money in the market for the next thirty years until he’s 60. 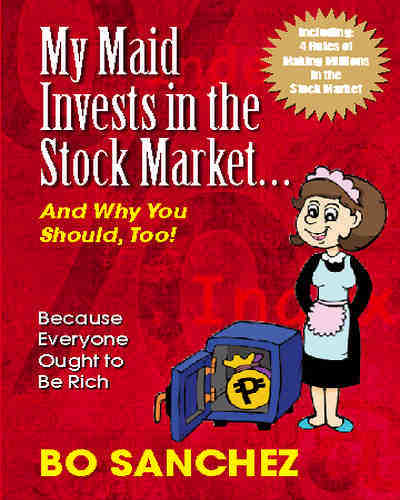 Late Leslie waits ten years before she starts investing Php100 a month into the stock market for the next thirty years until she is also 60. Early Eddie invests early, Late Leslie waits and invests late. Who ends up with more money? Eddie who has personally contributed Php12,000 or Leslie who has personally contributed Php36,000? Eddie has contributed Php24,000 LESS than Leslie but because time is the friend of compound interest… Early Eddie wins by a LOT. So, if you want to retire early, INVEST EARLY and OFTEN. The more you’re able to save early, the harder your money will work for you later on. 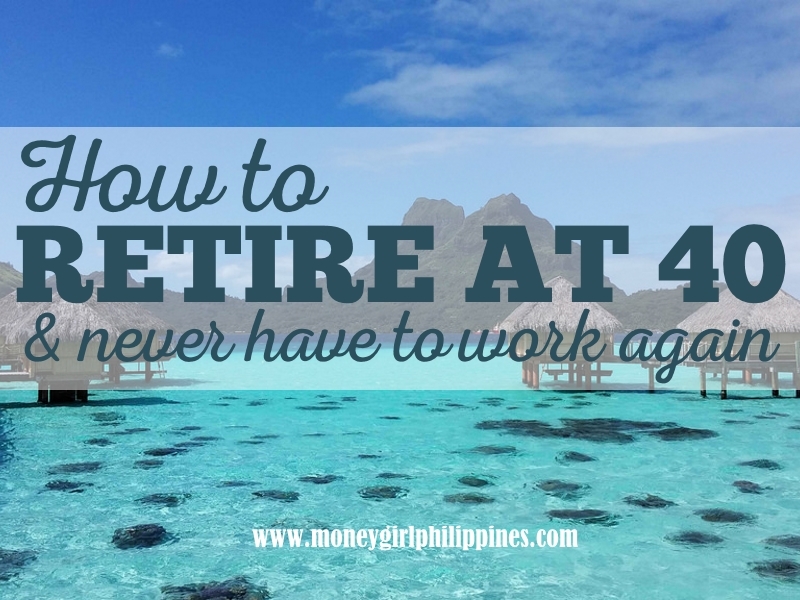 Anyways, retiring by 40 isn’t easy, but that shouldn’t stop you from trying. If you are ready to put a stop to your days of working for a living, welcome to the club. Let’s all aim for financial independence and freedom! Read through these pages, comment where you like, and please feel free share this post to your friends. Nice article. Although I am 41 right now I believe I can retire comfortably as long as I invest my time, effort, and money wisely. This is a great article for OFW’S too. What a nice and good advise, it will really open up our mind to have this big dreams. as well as to have more time to spent with your Loving Family. This reminded me again of my financial goals. Thanks for these practical and wise tips. Can you please suggest a bank/company I can put money with compound interest? thank you.